Georgia-born and Atlanta-bred, Skye Paige has the special ability to understand both the dusty back roads of country music and the neon glow of big-city rock. It's a perspective that has lent itself to both her music and her burlesque shows. Now living in Charleston, SC, Paige injects her blues and country roots with a sultry shot of rock 'n' roll and '50s pin-up fashion. Her style is raunchy, rawkin', outlaw country blues, and she tears up a slide guitar! Whether she is whisking you away to Hawaii with the sounds of her ukulele or luring you back to her coffin for a midnight snack, she will steal your heart away forever more! Chickens & Pigs is Atlanta's own rockin' stompin' blues band, featuring Jeff Evans on guitar / vocals, Michelle Friedman on bass / guitar / drums / vocals, and Mr. Bingles – the electric bunny. 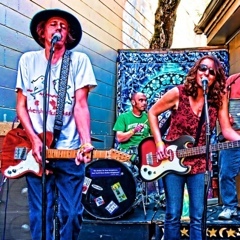 With lyrics that are sometimes bizarre, sometimes strange, but always entertaining, Chickens and Pigs will take you on a journey of blues-raga, country-folk, Rolling Stones-type rockers, alt-country, blues rag, traditional folk and groove-blues. Get ready to cluck your oink off! Kahle Davis kicks things off at 8pm.